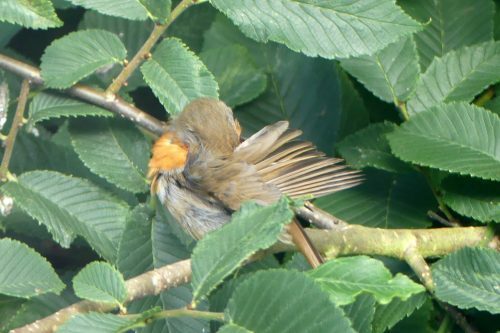 “The perfect spot for sunbathing, in a peaceful woodland edge location, offers privacy and safety in which to relax or indulge in some leisurely grooming preening. No charge for use of facilities”. This summer this ideal location, set conveniently for me just a few metres from my kitchen and bedroom windows, has been a popular spot with some of the local birds, particularly some of the younger ones.They come to make the most of this sheltered sun-trap to sunbathe, also known as ‘sunning’ in application to birds. 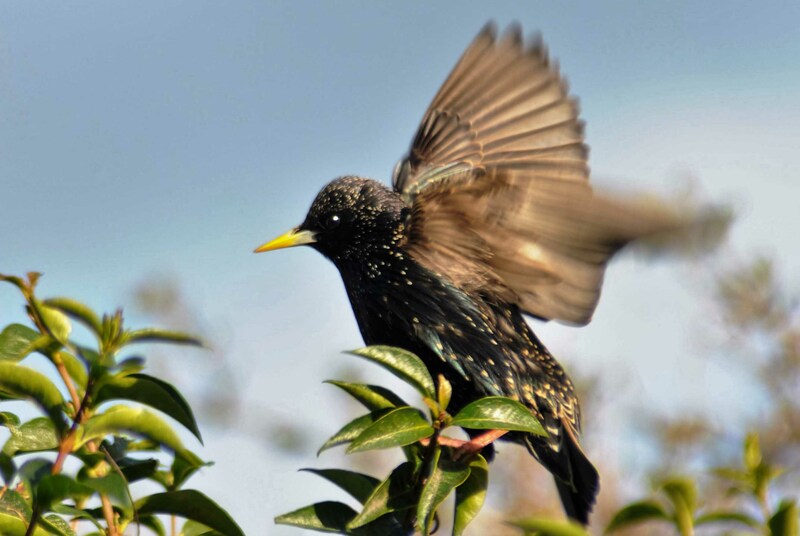 Sunning birds may become so absorbed in the activity that they are easily approached, which can make them vulnerable to predators. They are safer here; there is no easy access to this spot from any angle, although a savvy Sparrowhawk may possibly be able to make a strike if it got its timing right so as not to cast a shadow. 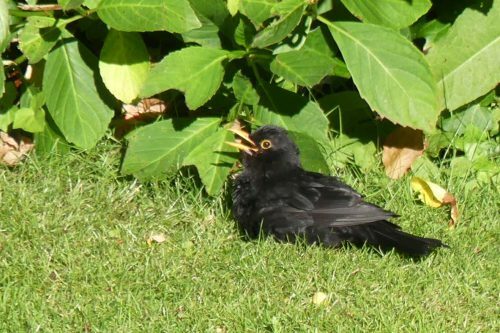 Most commonly we see Blackbirds and sometimes Robins sunning in gardens , but other species indulge too in slightly different ways. To begin sunning, birds orient themselves to expose the maximum amount of their plumage to the sun. 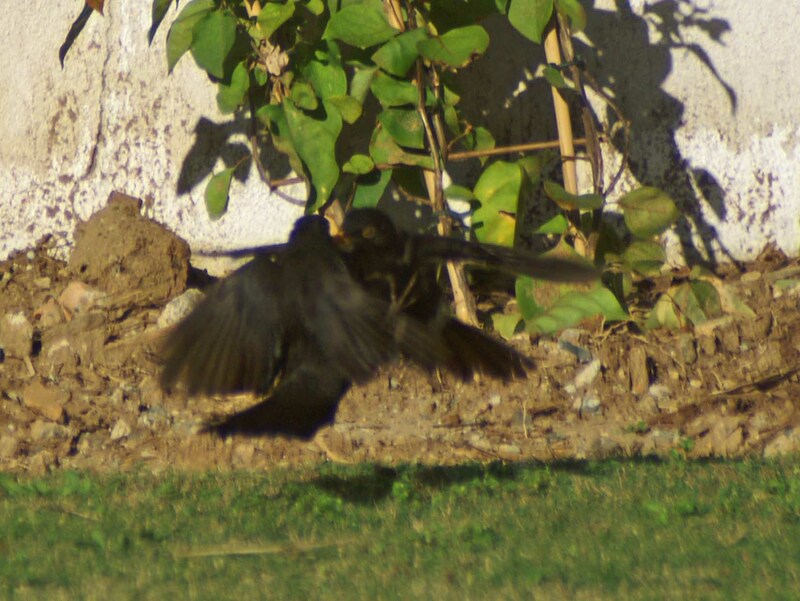 The classic sunning posture is thus: head and body feathers are fluffed up and out and depending on available space and/or sense of security felt, one or both wings are held out from the body with feathers spread; the tail is sometimes fanned out too. 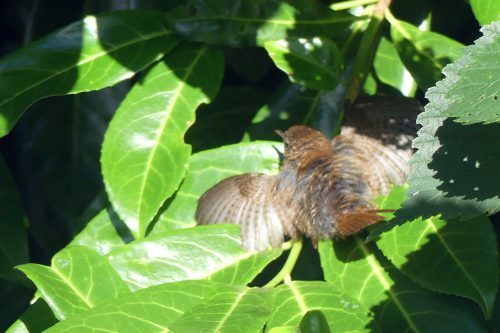 The bird may keep the same position throughout a sunning session, or it may change positions to expose different parts of its body to the sun. 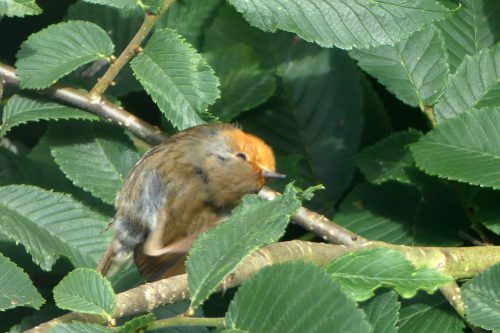 Sunning is often a precursor to preening, vital to a bird’s feather maintenance, and in this instance it is thought this has two effects; one is that the sun’s heat helps to spread preening oil across the feathers. The other is that it drives out parasites from within the plumage that can then be more easily dislodged as the bird preens. I’m fairly sure this session was more concerned with pest control than anything else. 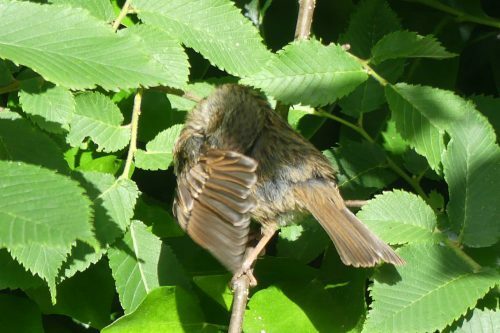 Firstly, adopt the sunning pose: fluff out feathers and spread tail and wing feathers. Well, alright just the tail feathers will do for now. 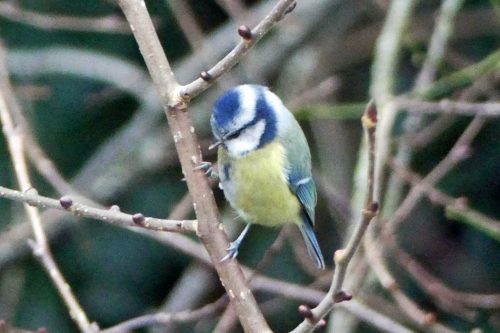 Secondly, begin preening with any particularly itchy spots caused by unwelcome hitchhikers. Some areas such as the head and around the eyes and bill can only be serviced by extending and lifting the leg and having a good old scratch. It helps to have a flexible neck. That will have to do for now, it’s getting a bit shady here.Time to go. 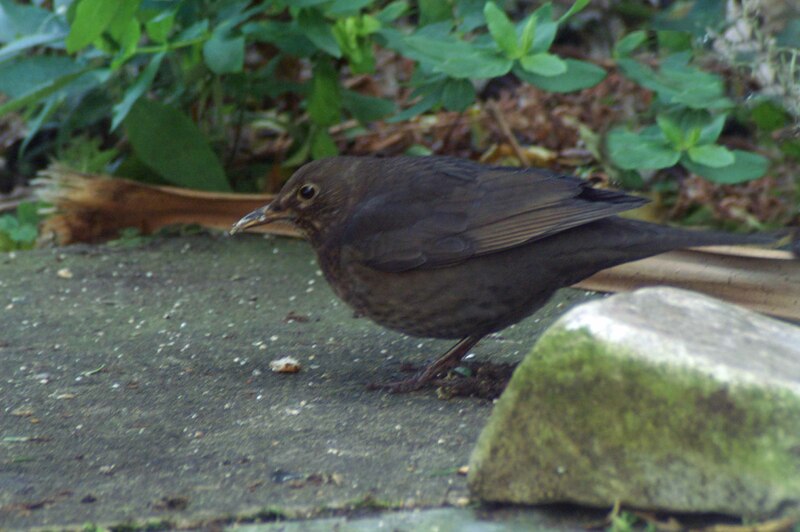 The young Robin in the following sequence of images seems to be similarly afflicted with ‘lumps’ apparent on its neck. 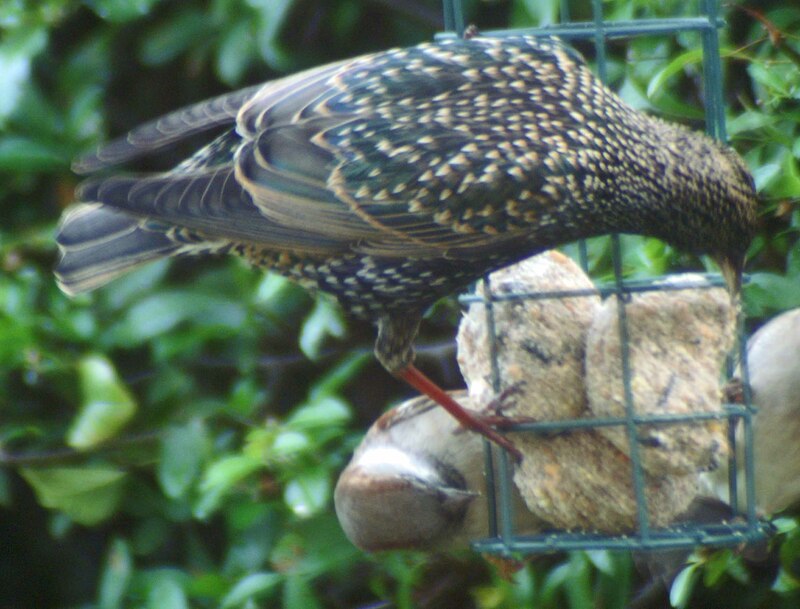 The head and neck are areas birds are unable to reach with their bills and have to scratch with a foot. The other side needs attention too. 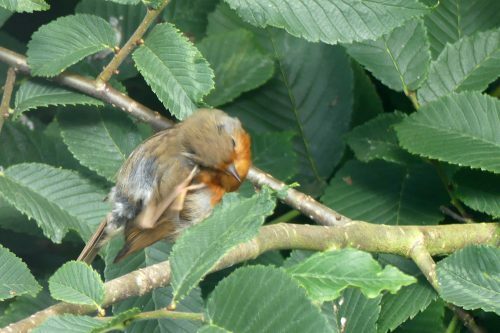 It looks as though the bird’s frantic scratching has created a bald spot. And is that another lump under its eye? 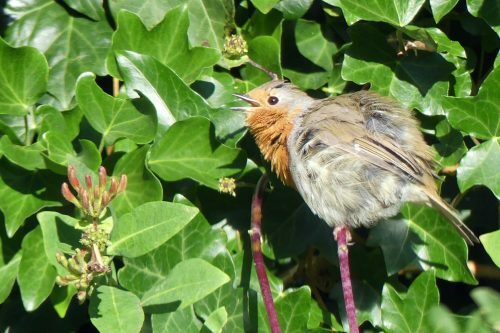 During sunning sessions birds often have their bills open. This is because the warmth of the sun raises their body temperature and as they can’t release heat by perspiration, they have to regulate it some other way, so will gape and sometimes pant in order to lose heat. 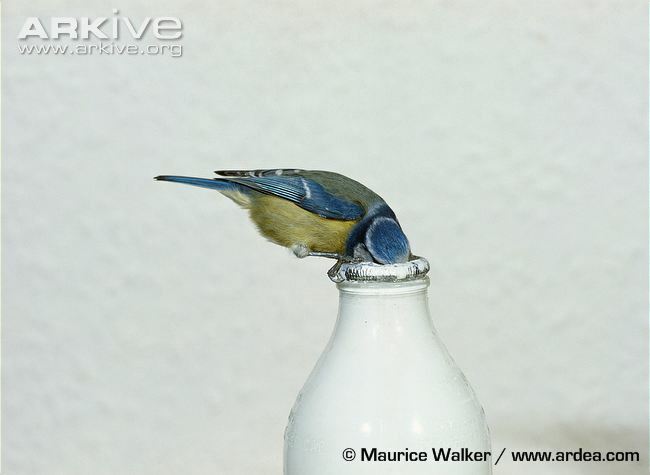 To sum up, no-one knows for certain the reasons birds sunbathe, although several theories have been proposed. 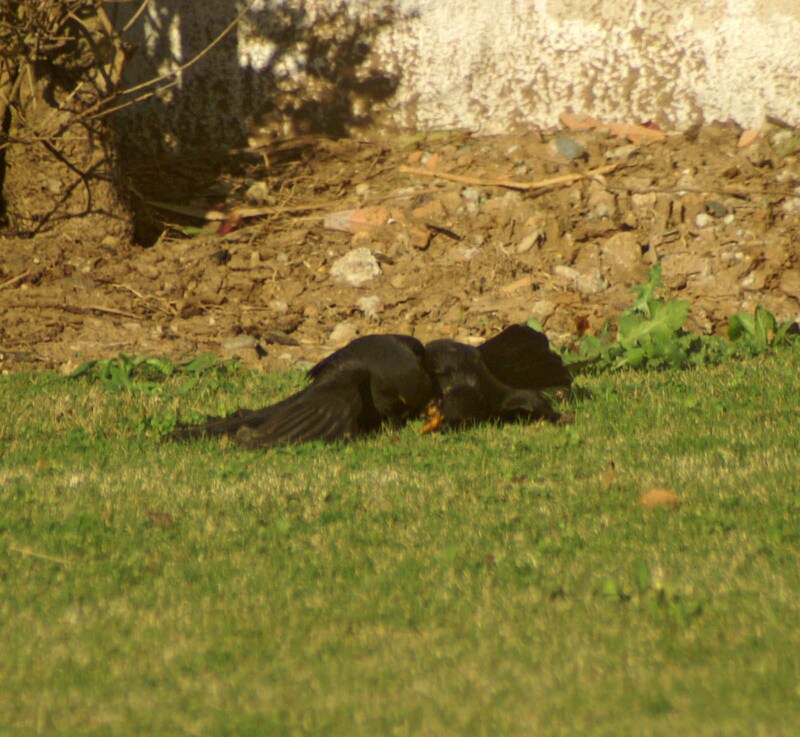 To maintain the bird’s feathers in good condition. Exactly how sunning assists with this is not known, despite being widely studied. 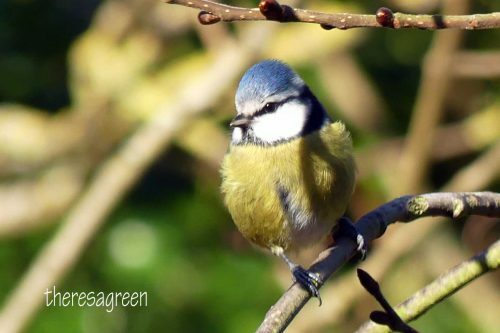 All birds have a gland on the rump, called an oil gland. 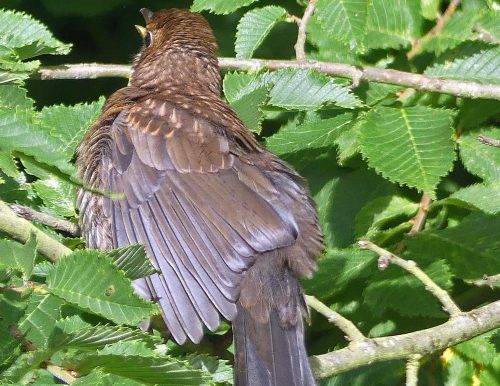 The ‘preen-oil’ that this gland produces helps to keep the feathers flexible and hygienic. 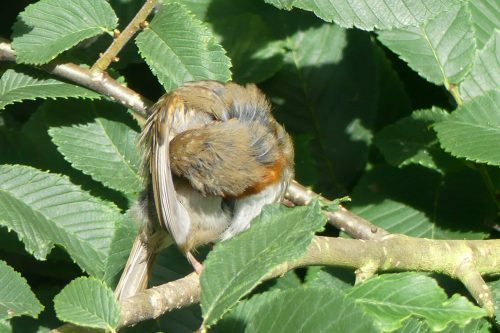 As preening usually occurs directly after sunning, it has been suggested that the sun affects the preen-oil in the feathers in some beneficial manner, or that it helps to synthesize the Vitamin D and helping to regulate it’s temperature. 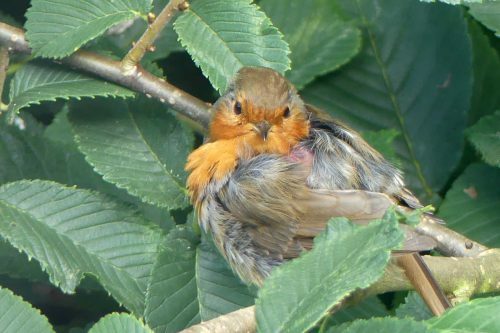 The heat from the sun may stimulate activity in parasites within the feathers, making them more accessible when the bird starts to preen. 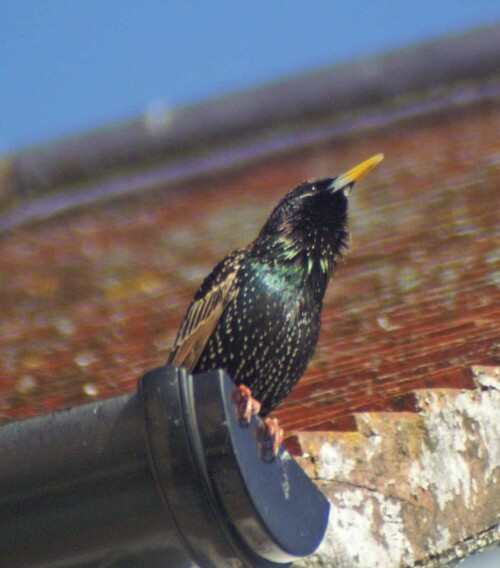 Birds also make use of the sun’s heat to increase their body temperature or prevent heat loss. 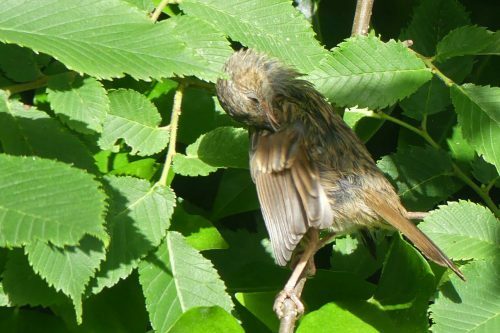 This form of ‘sunning’ is also used when the bird dries itself after bathing. They do it simply because they enjoy it. 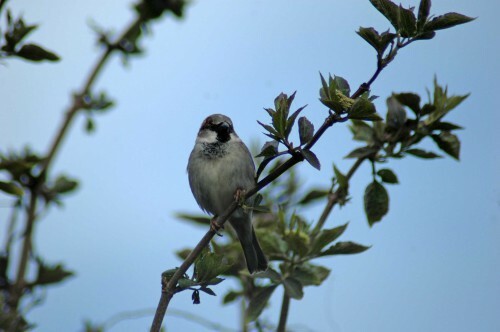 Our local ‘gang’ of House Sparrows are currently livening up the neighbourhood with their cheerful chirpings and chatterings as they go about industriously sprucing up their nests. A few pairs have located theirs very close to the house but tucked safely within the depths of the fiercely prickly pyracantha hedge, then at least one or two others are sited in the loftier location of the eaves of the front of the house from where they must have wonderful views to the Little Orme and right across Colwyn Bay and the Irish Sea. 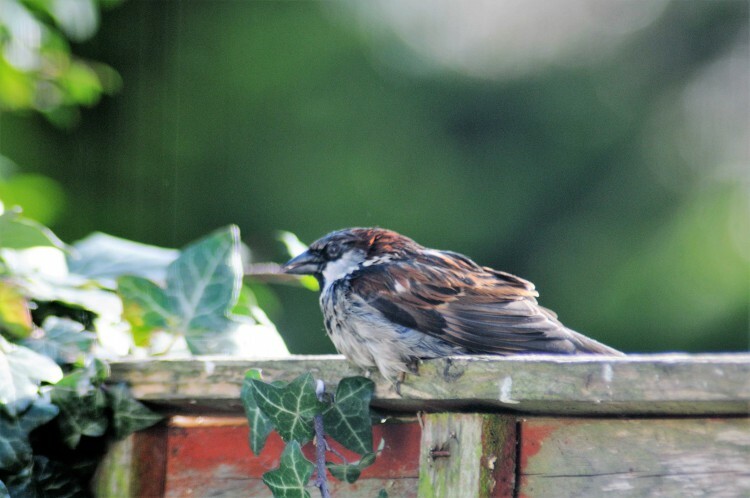 I have always loved House Sparrows and in these days of generally lesser numbers of them, I consider myself very fortunate to have had their company everywhere I have ever lived and truly hope it continues that way. 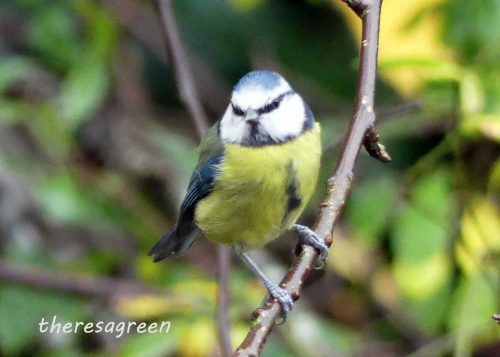 My affection for these charismatic little birds grew from sharing a home with them, quite literally, during the ’60s when our family lived in a thatched cottage on a country estate in Northamptonshire. 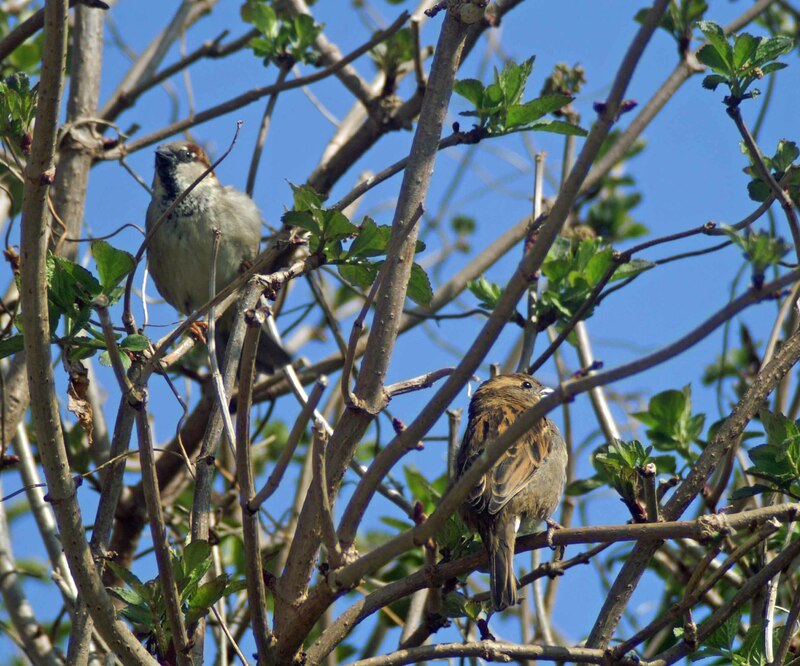 Back then house sparrow numbers were much greater and along with jays, crows, wood pigeons and foxes were considered as pests and used as target practice by the estate’s gamekeeper, or indeed anyone of any age with access to even a simple air rifle. 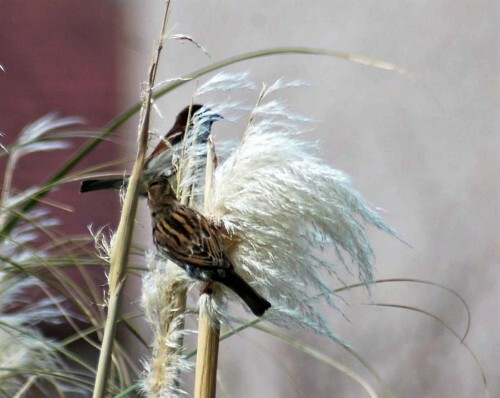 Admittedly the birds did have a tendency to make a bit of a mess of the thatch by extracting reeds to construct their nests, but how were they supposed to know our roof was not just a convenient pile of grass stalks? Besides which, their similar activities throughout the estate probably helped keep the local thatcher in steady employment. 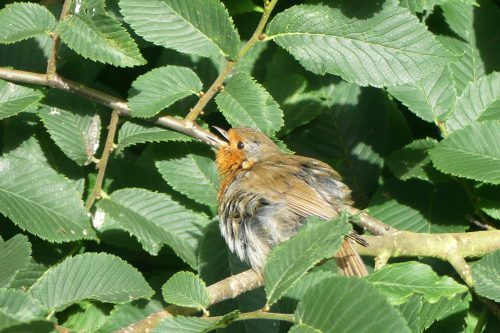 In gardens, sparrows have an unexplained habit of tearing the petals off flowers, particularly yellow or orange ones such as crocuses. In my old garden in South Wales they would decimate first my yellow crocuses, then the berberis blossom and then later the red-hot pokers…. 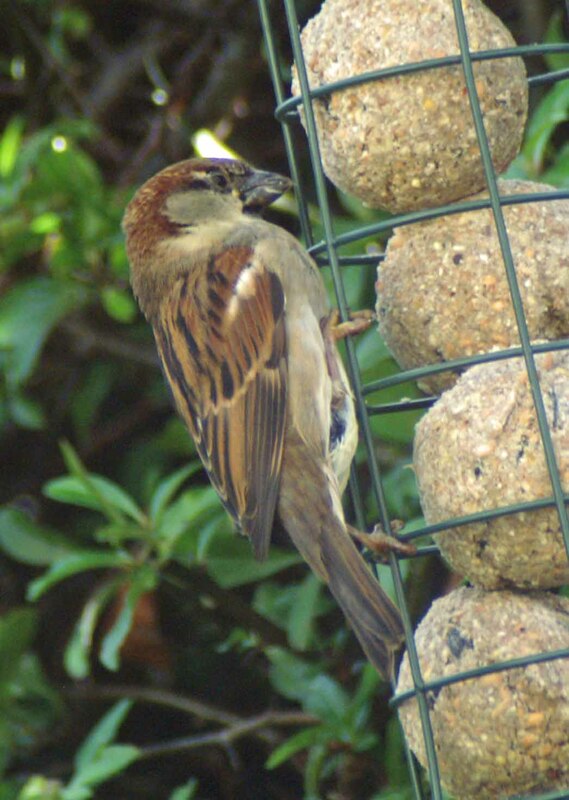 Sparrows have often been eaten and in some places still are. Sparrow pie was a common rural dish in Britain up to the time of the First World War, and even later: a sparrow pie containing 100 sparrows was served on 16 January 1967 at the Rose Inn at Peldon, near Colchester, perhaps for the remaining members of one of the “sparrow clubs” that were once common for trapping the birds. 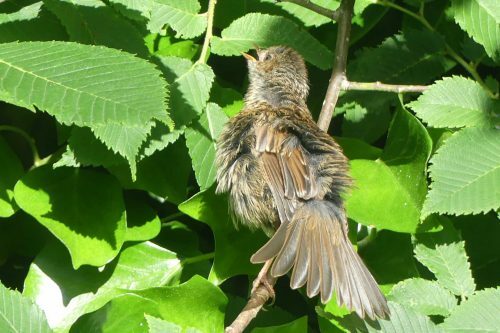 On the Continent, where small songbirds are still a prized delicacy, sparrows are sometimes illegally imported in great numbers from China: a consignment of 1,263,000 plucked and frozen sparrows was confiscated by customs in Antwerp on 28 January 1997, and a consignment of nearly 2 million frozen tree sparrows was seized by customs in Rotterdam in November 1993, in transit for Italy. 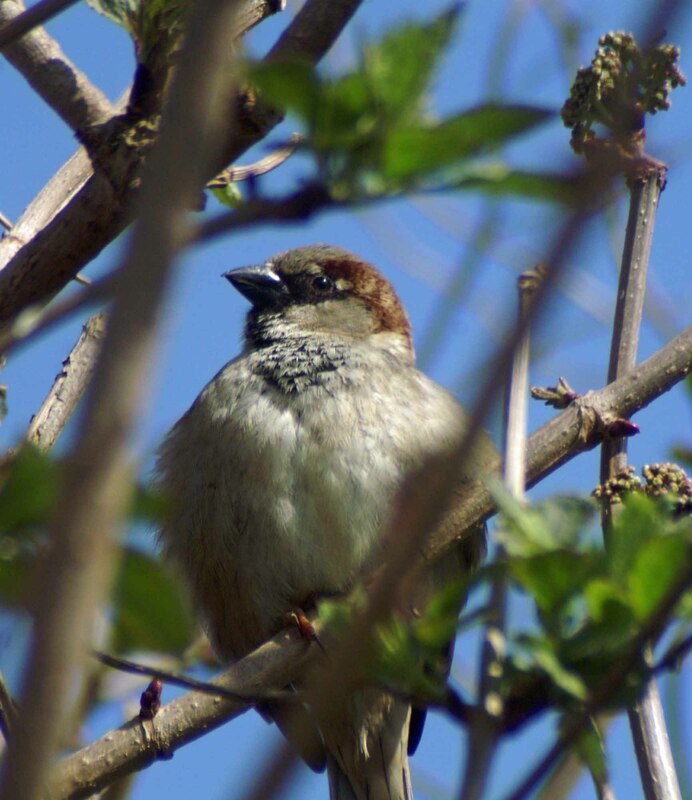 In 2002 in the UK, the house sparrow was added to the red list for endangered species. In 2004 it was added to the Worldwide International Union for Conservation of Nature Red List. 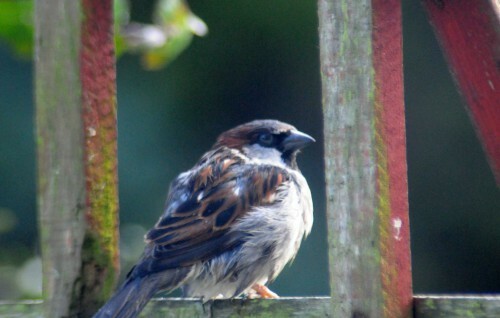 According to the RSPB we have lost 50 HOUSE SPARROWS EVERY HOUR FOR 46 YEARS! 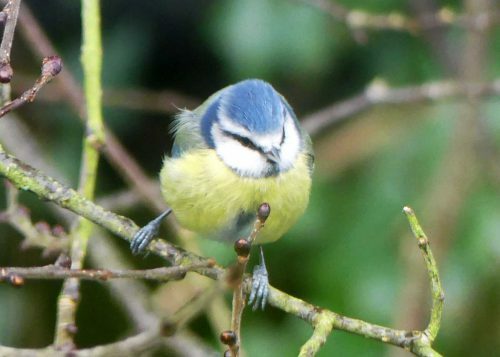 The State of the UK’s Birds 2012 report charts the ups and downs of our bird populations over the last few decades. 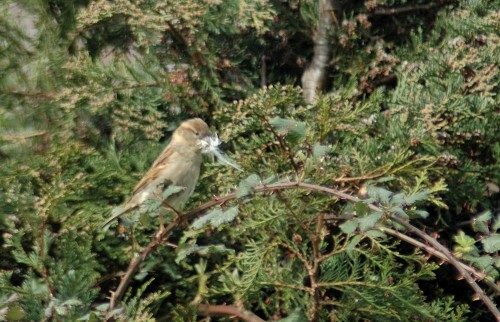 Although still abundant, the house sparrow has seen one of the greatest losses of any bird in the UK. 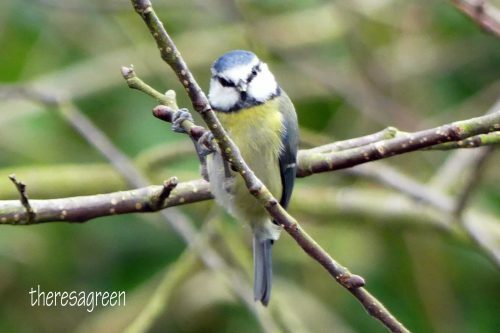 From an estimated 30 million individual birds in 1966, the UK house sparrow population plummeted to 10 million in 2009, a loss of 20 million sparrows in 43 years. 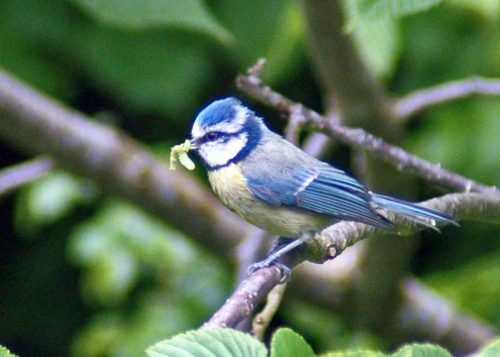 A number of reasons for the decline have been found, including predation by domestic cats, but first and foremost is the changes in farming practices, where more farms are using pesticides and herbicides and sowing seeds at different times of the year: adult birds eat grains and seeds, but they gather thousands of insects to feed their young. 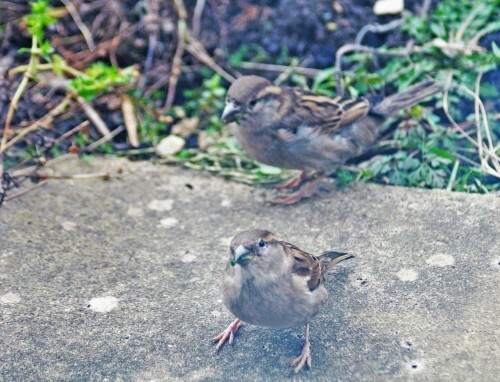 The sparrow population in London has plummeted by 68 per cent in the past 15 years, mirroring severe declines in numbers of the bird across the UK’s cities. 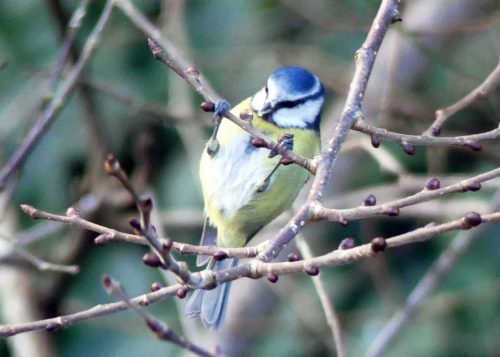 Research has indicated that changes to urban areas including increases in traffic, paving over gardens, removing trees and developing green spaces have led to a lack of seeds and insects which has left sparrows struggling to survive. 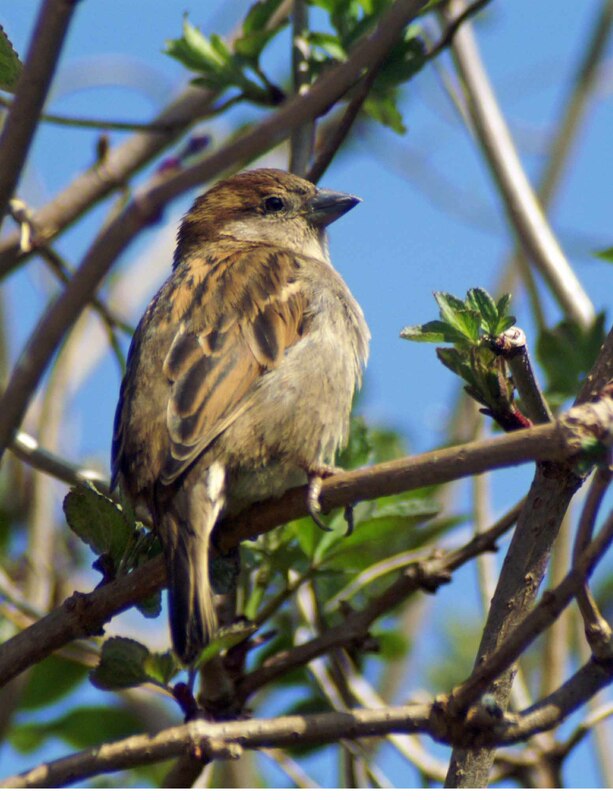 In the past the house sparrow’s likeness for crops resulted in farmers attempting to control their numbers. 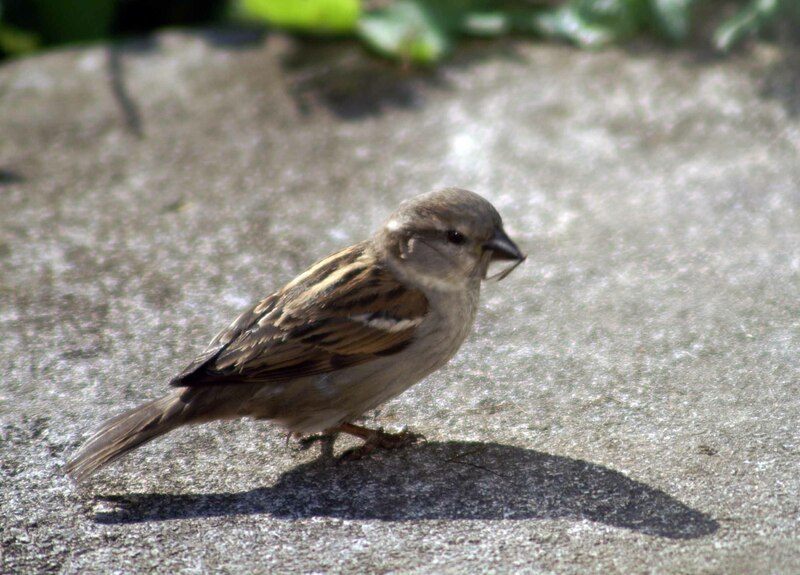 In the 18th century, sparrow clubs existed to destroy as many sparrows as possible and money was paid to do so until the late 19th century. 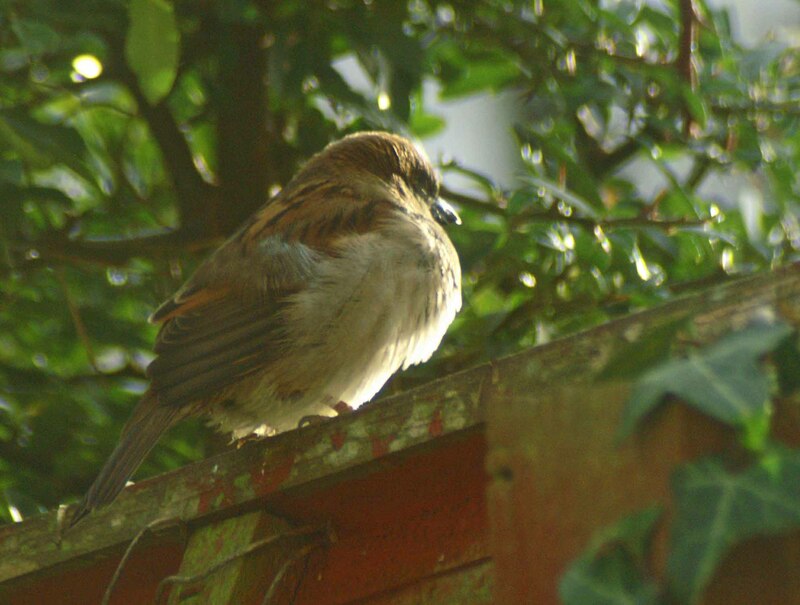 The house sparrow’s problems have by no means been restricted to the UK. 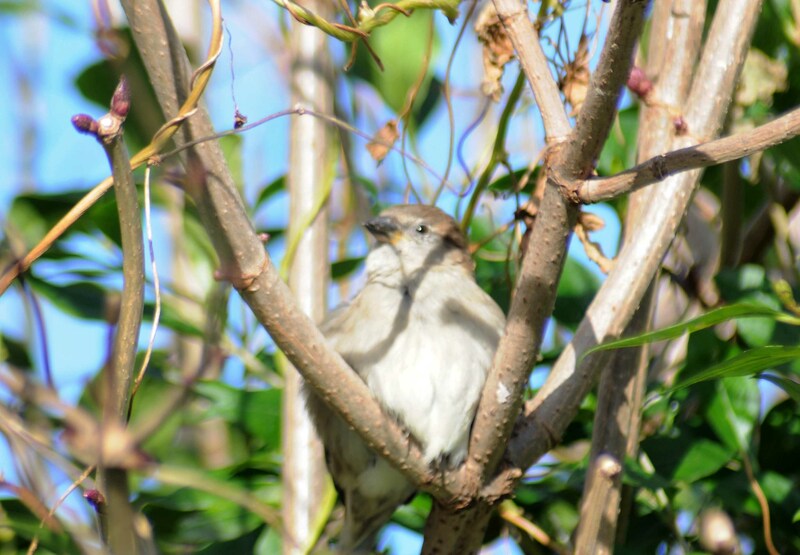 The Sparrow has followed man to most parts of the globe where they have adapted to a whole range of differing environments and habitats. 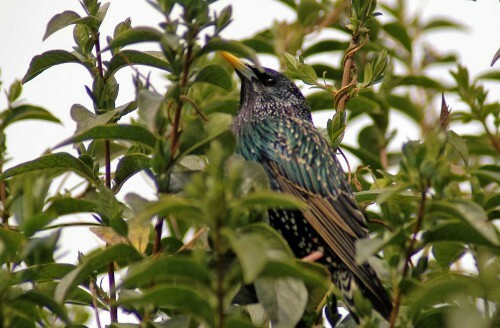 Wherever they have found themselves they have quickly settled in acclimatised, found food and nesting sites. They are true world citizens, but have not always found acceptance or integration easy; they have often been the subjects of much prejudice and discrimination. A certain traveler who knew many continents was asked what he found most remarkable of all. 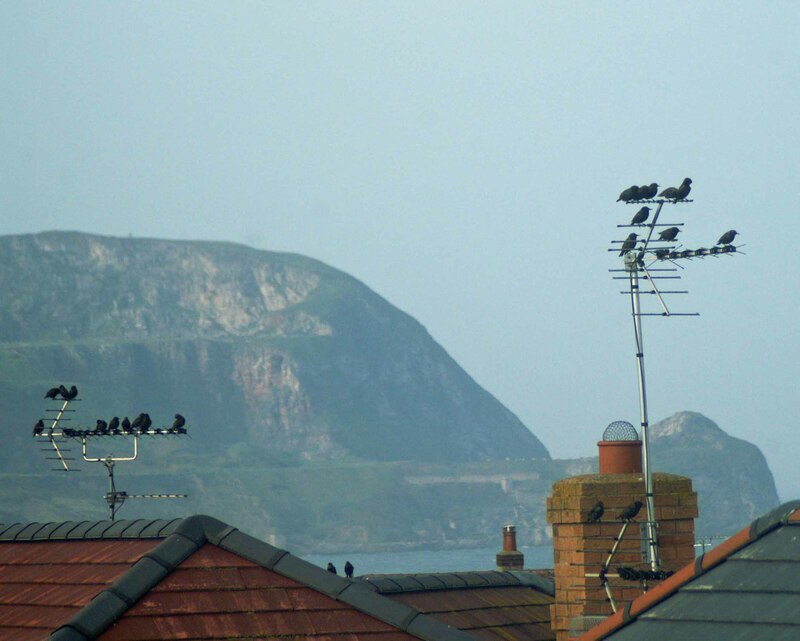 He replied: the ubiquity of sparrows. 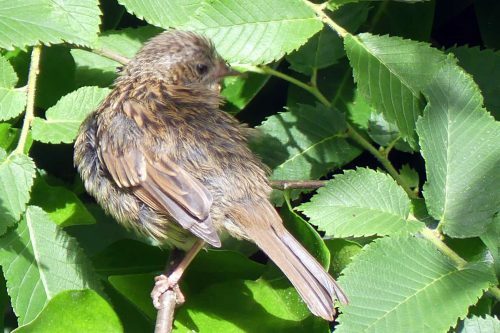 In Europe, in the 1700s, local governments called for the extermination of house sparrows and other animals associated with agriculture. 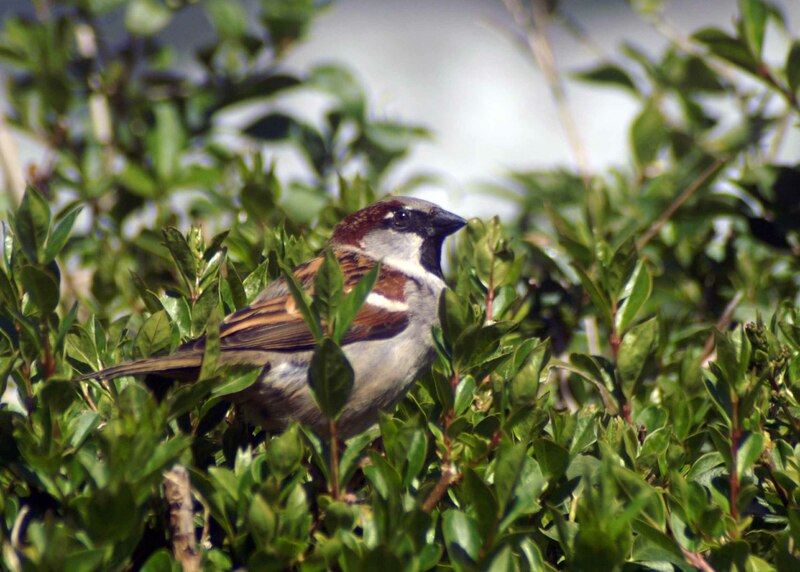 In parts of Russia, your taxes would be lowered in proportion to the number of sparrow heads you turned in. 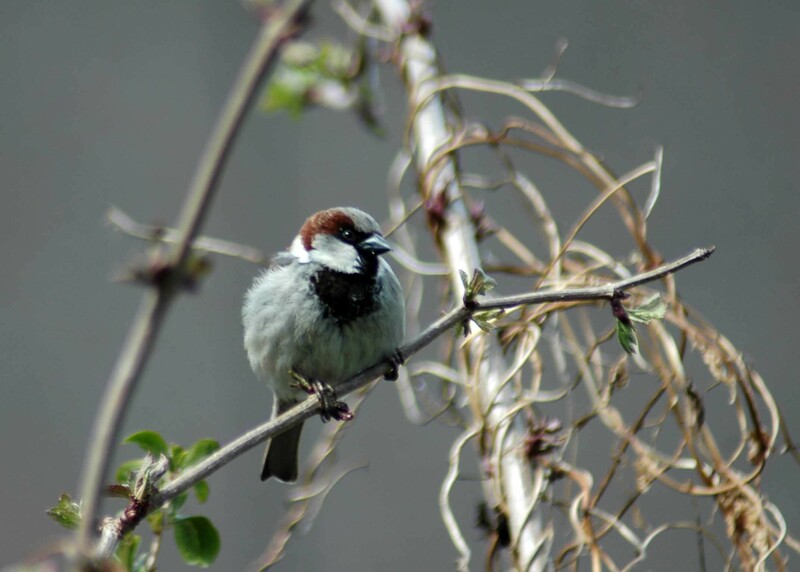 In China, the Great Leader Mao Tse-Tung decided in 1958 to get rid of sparrows, calculating that each bird (the tree sparrow) consumed 4.5kg of grain each year and that for every million sparrows killed, there would be food for 60,000 people. He mobilised the population to kill the birds, to great effect: at least 2.8 million sparrows were killed in Shantung province alone. 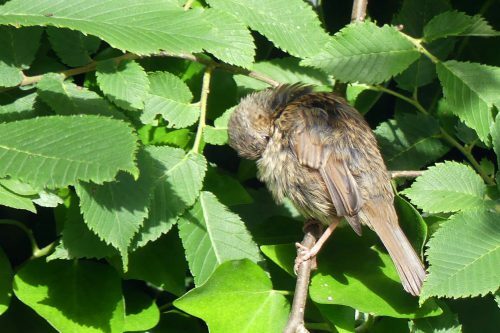 But what Mao had not taken into account was the number of noxious insects the sparrows consumed when rearing their young. 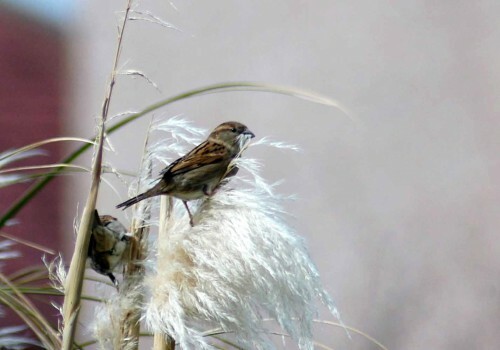 When the sparrows were killed, crop production increased, at least initially. But with time, something else happened. Pests of rice and other staple foods erupted in densities never seen before. The crops were mowed down and, partly as a consequence of starvation due to crop failure, 35 million Chinese people died. 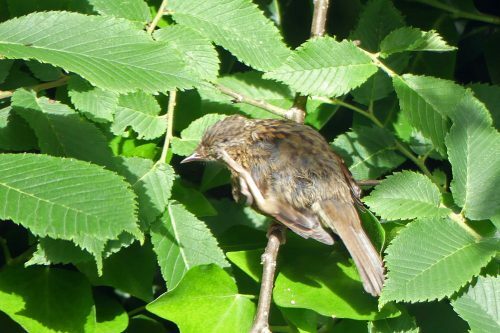 That is when a few scientists in China began to notice a paper published by a Chinese ornithologist before the sparrows were killed. 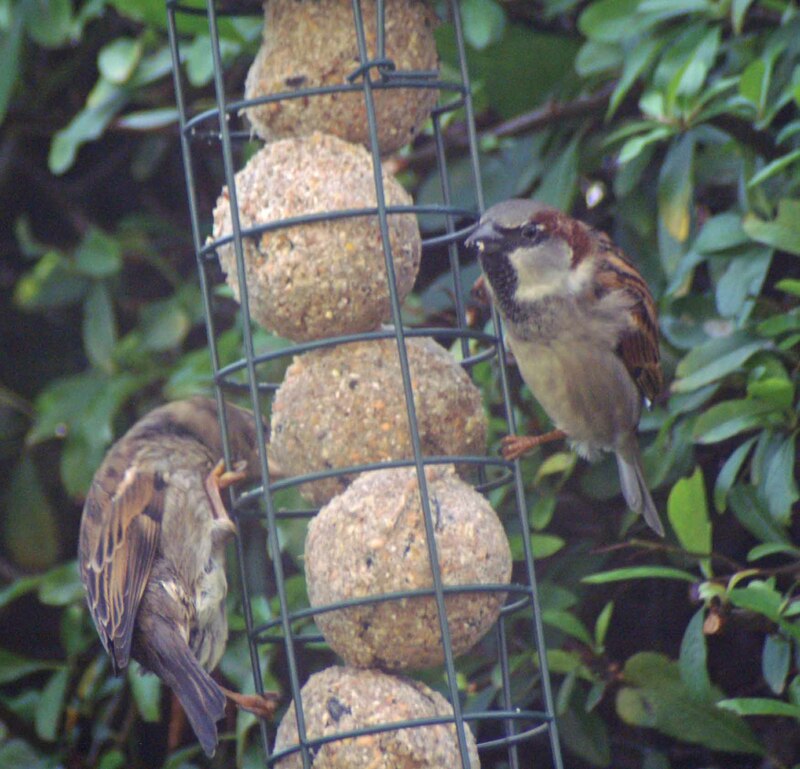 The ornithologist had found that while adult tree sparrows mostly eat grains, their babies, like those of house sparrows, tend to be fed insects. In killing the sparrows, Mao and the Chinese had saved the crops from the sparrows, but appear to have left them to the insects. 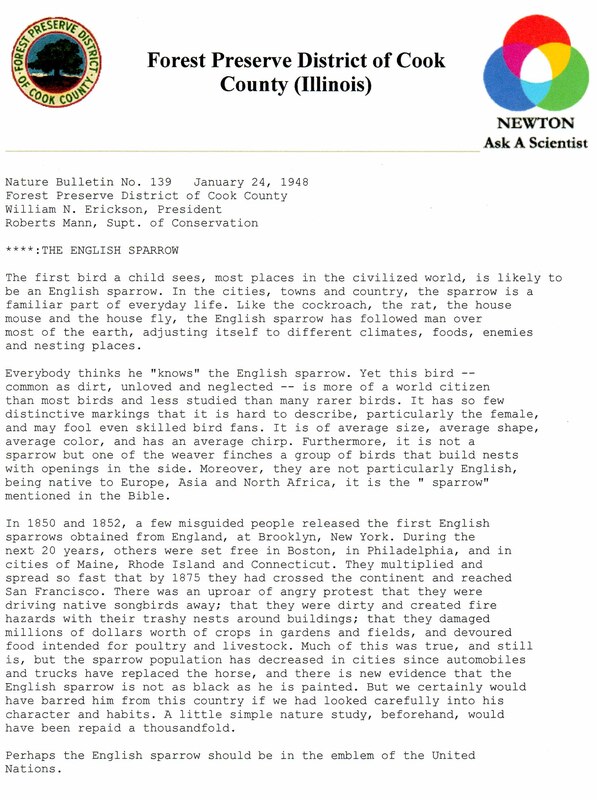 And so Mao, in 1960, ordered sparrows to be conserved (replacing them on the list of four pests with bedbugs). 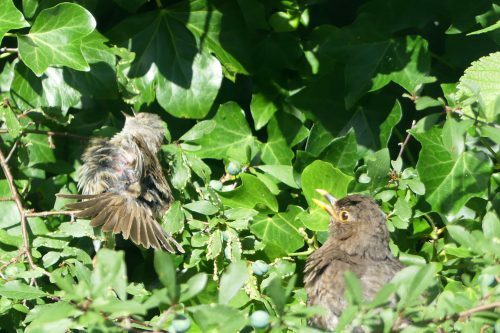 Conservationists have launched a scheme to turn parts of London’s parks into meadows in an attempt to reverse the decline of the once-common house sparrow. 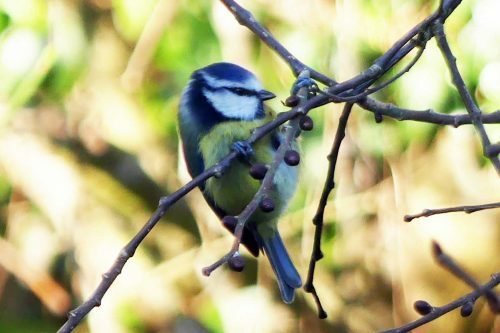 The £170,000 scheme is being funded by the SITA Trust which manages funding raised through taxes on rubbish sent to landfill.The conservation charity has teamed up with a number of partners across Greater London to run a three-year project to try and provide food-rich habitats for the birds. 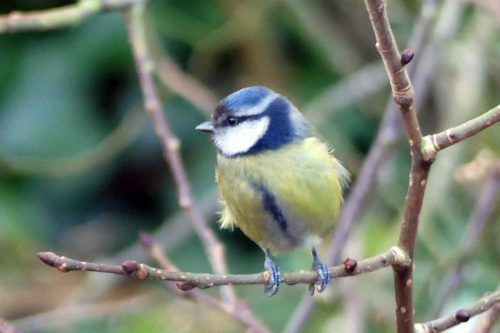 Tim Webb, spokesman for the RSPB, said the plan was to sow areas of more than 20 parks in the capital with wild grasses and flowers to provide seeds and attract insects. 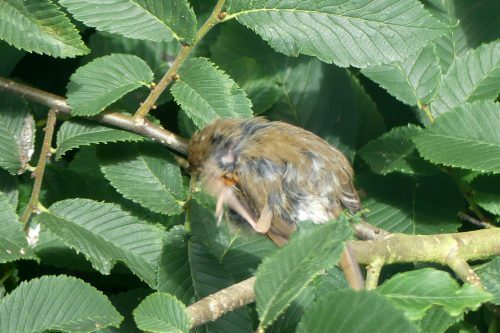 Many chicks are dying in the nest of dehydration or starvation because there are not enough moisture-rich insects for them to eat. 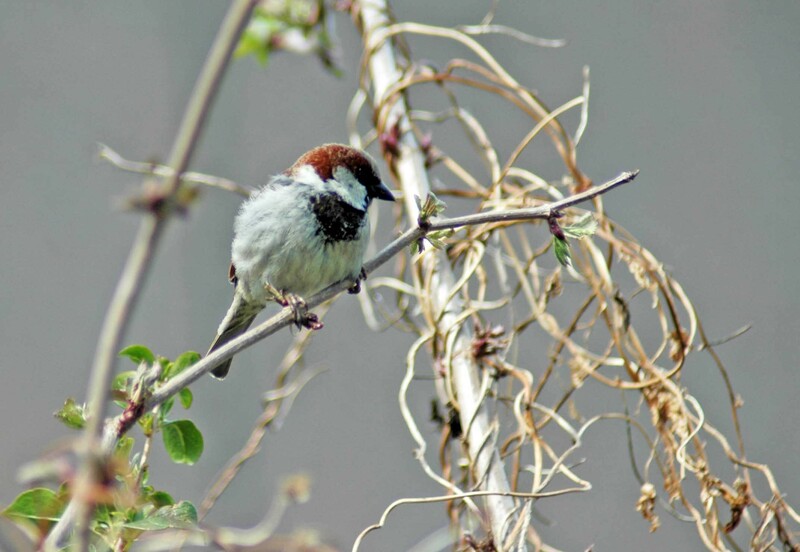 In India, where the birds have also suffered a serious decline in numbers in recent years, there are campaigns to raise public awareness of the birds and their plight, and in 2010, the date of March 20th was nominated as “World Sparrow Day”, henceforth to be celebrated annually. 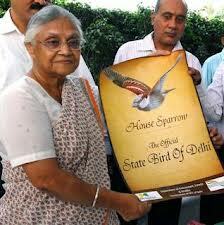 The humble house sparrow has become the State bird of Delhi with the issue of a notification to this effect, Chief Minister Sheila Dikshit announced o Friday. Addressing school children at her residence during a function organised to celebrate Wildlife Week, Ms. Dikshit said the idea behind making the house sparrow the State bird was to protect it. 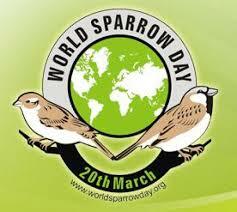 She said the number of house sparrows in the city had declined sharply due to rapid urbanisation. 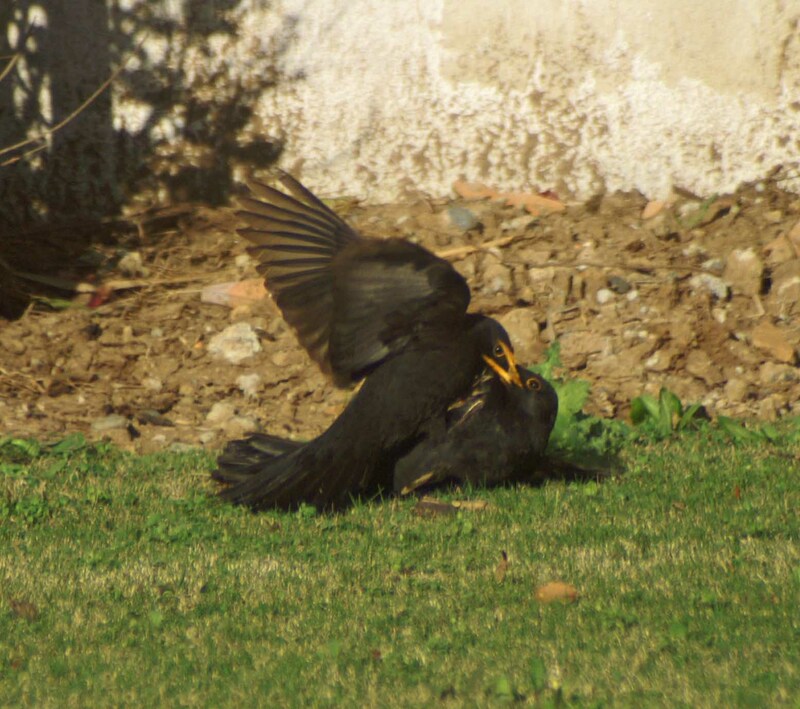 I’ve just read the latest fascinating post from one I follow – Finn Holding’s ‘Naturephile’– on the topic of the territorial battles between male blackbirds and was transported back to my garden in southern Spain, where I witnessed similar dramas on several occasions. 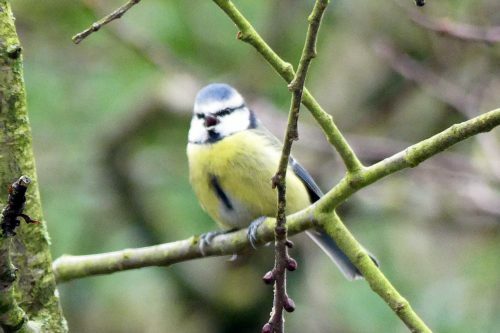 Spring arrives slightly earlier there, so the breeding cycle and related territorial skirmishes are about a month to six weeks ahead of the UK. The following is an extract from my Spanish blog dated January 2011; my pictures were taken in 2008 and some are not quite as clear as Finn’s, but I think they similarly portray some of the real fierceness of these encounters, particularly those of the pair on the ground. 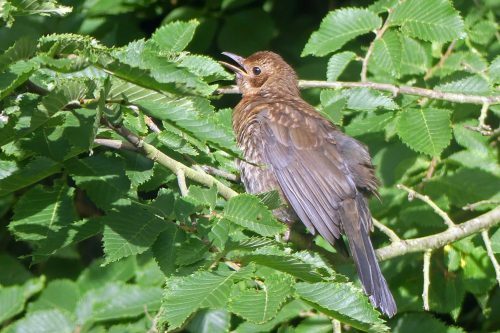 “Blackbirds are very numerous hereabouts, thanks no doubt to year-round access to plenty of well-watered lawns, berried shrubs and trees and safe places to build their nests. 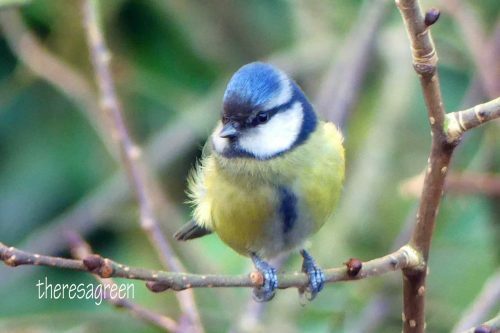 We have had a pair nesting in our garden each year we have lived here so far, most years successfully raising a family of three, and a few times managing two broods. 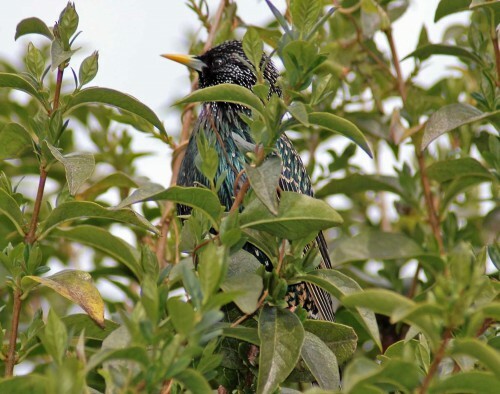 This breeding success, repeated throughout the area, often results in a local population explosion, which come the onset of the next breeding season means there’s a lot of competition for the best territories. 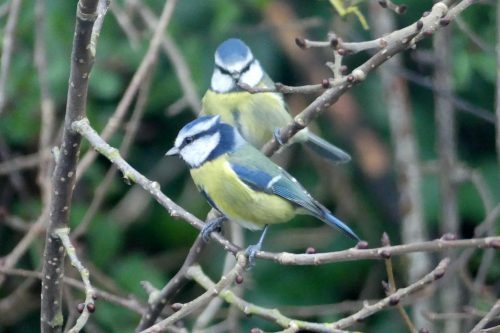 At this time of year I have seen as many as six males in the garden at any one time demonstrating the familiar challenging routine that generally involves a lot of following and retaliatory chasing between two or sometimes more birds, with one usually succeeding in sending the rest packing, often protesting loudly as they retreat over a wall or hedge. The fight I photographed, (25th January 2008), took the competition to a whole new level the intensity of which I had never witnessed before. 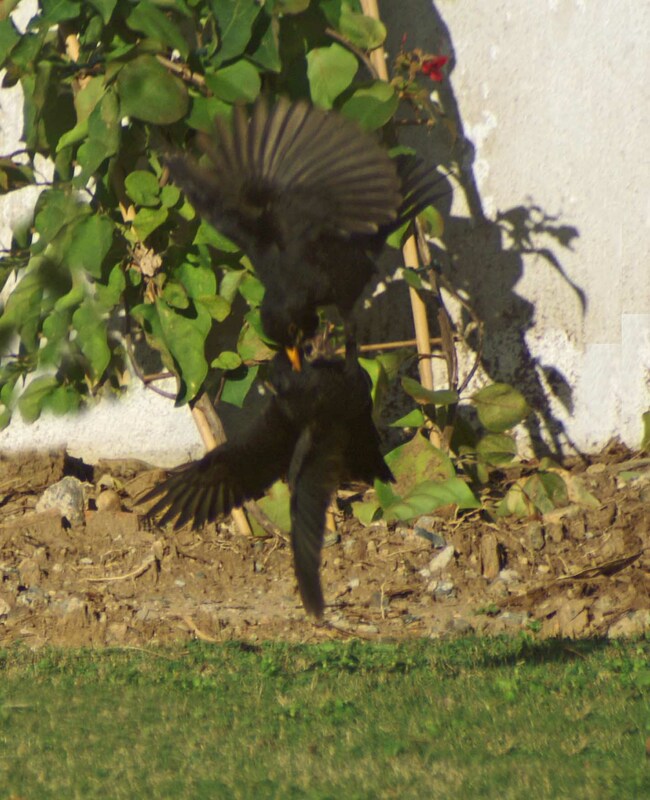 The duelling began in pretty much the same way as usual, with one of the birds shadowing the other as it ran between shrubs or along the corridor between the hedge and the wall, then the one being followed would turn and lunge at its follower and chase it purposefully, attempting to intimidate it into leaving. 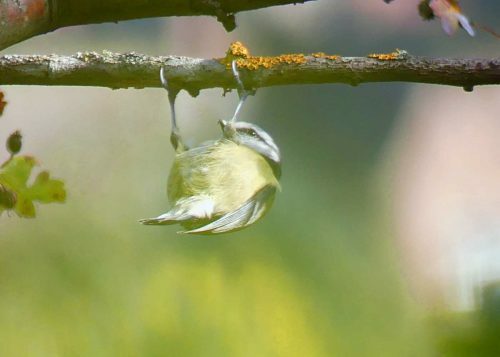 This behaviour went on for days, with each challenge lasting for quite some time, which must have been very tiring for the birds. 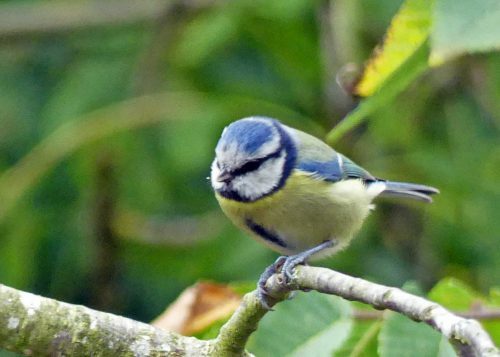 The contenders must have been very equally matched and more determined tactics called for, and chases began to be more aggressive, with the birds flying up at one another, bill to bill until one departed. This happened over several mornings, but the incidents were so brief, or in an awkward place that I failed to get anything on camera. Then one day one of them must have decided that enough was enough and that there would be no more Mr. Nice Bird, as the following pictures show………. 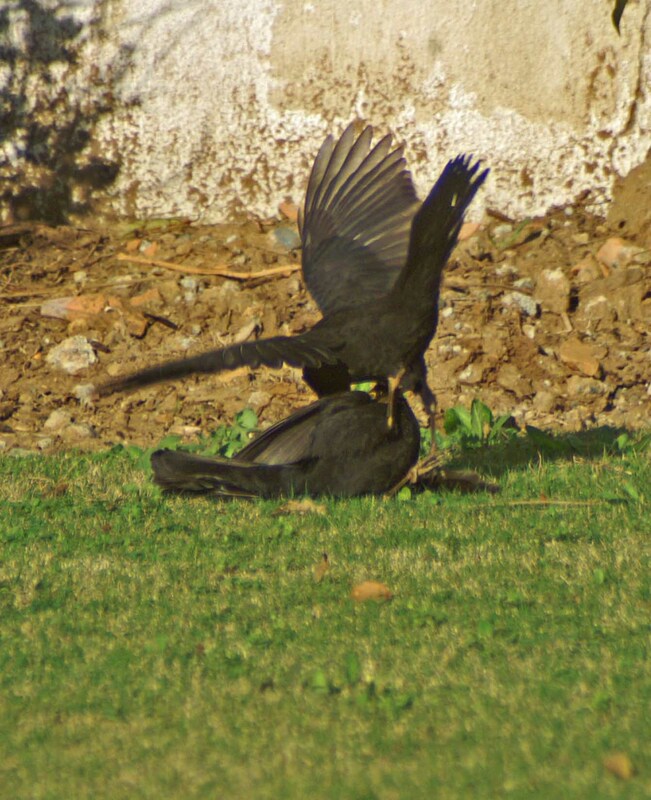 Despite the apparent ferocity of the attack, I don’t think either bird was seriously hurt, but as they were very similar in appearance and well-matched too, I have no idea which one emerged as the victor. via January | 2011 | nightingale trails.